This is Archive Page 29 | Close this window to see the News Archive Menu. 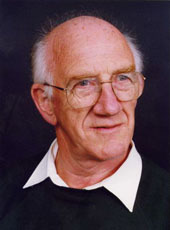 From Brigg Grammar School, John Rhodes won a place at Wadham College, Oxford to study English. After graduation and completion of a teaching qualification he began a distinguished teaching career which was to last 40 years, the last 20 years of it as Head Teacher of St Ivo School in St Ives, Cambridgeshire. After retirement, John took up further challenges, as he will perhaps relate in his remarks at the Annual Dinner, and has continued vigorously to pursue several other interests. To see more details of the 35th Annual Dinner on 19th March and to book your place, please see the Newsletter. If you have not received a copy, you can download the Adobe Reader version from our Library Page by clicking on the right. Reminder: you will find a link to John Rhodes' excellent memoir of his schooldays at the Grammar School by going to our Library Page. I enjoyed my 5 years at BGHS in spite of an altercation with a flying rounders bat in the first year - when my front 3 teeth were knocked out! 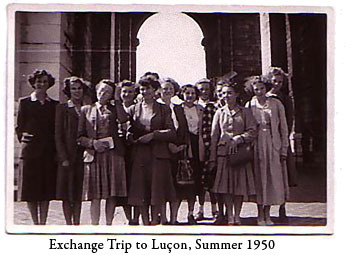 I learned to swim, play tennis, discovered languages and foreign travel - well one trip to France. We came in from Broughton by Bus each day, and as my father kept a few pedigree goats, thanks to kind drivers, I took a gallon of milk to Dent's shop for Ice Cream making each day. The driver waited until I took it in, and then continued down Wrawby Road! My parents had two boys in 1948 and 1950, so I left school in July 1950. I did office work to begin with, and after I married, my first child was still born, and my second needed an exchange transfusion - I've a rare Rh. Negative Blood Group, but my husband hasn't - so our groups are incompatible. He was in Korea in the Army, so his medical details were not immediately available, and she was only given extra blood, resulting in her having cerebral palsy. When our daughter was 4, our third child was still born, and a week later my husband had a serious Road Traffic accident. sustaining a head Injury, broken bones, and a dislocated spine and was off work for 6 months. At 6 + years old, she went as a boarder to the Palace School Ely (for Physically disabled girls). So, during term time, every Saturday for the next 10 years, we drove 240 miles, round trip,to visit. She and we made some good friends with other pupils and their parents and families. Our daughler married, and had one boy, who eventually gained an upper second honours in Fine Arts. He also has had one boy, so now I'm a Great Grandmother! When my daughter went to school, I started work again in Local Government, moving around a number of departments - some of which involved visiting peoples' homes, and eventually did the Dip.C.G and later F.E Teaching Cert. In my spare time, I did a Spanish Course and C&G Fashion and Design!! We spent many happy holidays in Spain, both with friends from the U.K and with Spanish friends in their homes. Later on I worked freelance, teaching clothing industry trainees for short periods, and with an Agency importing marble from Spain & Portugal where I went down into a deep quarry in a 4x4 vehicle, sitting In the front. Our daughter is now widowed, and manages very well with help, but we are now thinking of looking for a bungalow in Brigg to be a bit nearer to her, than here at Sutton-on-Sea. Any suggestions gratefully received! SEE BELOW FOR INFO ABOUT PLANS FOR A BGHS REUNION. I attended both Brigg Grammar and Sir John Nelthorpe from 1975-77, 77-80 respectively. I have just for the first time read the excellent newsletter you produce, I shall be sending my membership fee shortly and hopefully attend some of the 2011 events. About me: As stated above attended both schools in the transitional period, not that academically minded according to several teachers!! Joined the Infantry Junior Leaders at Shorncliffe in 1980 and went on to complete 23 1/2 years attaining the rank of Warrant Officer. Served in Northern Ireland, UK, Cyprus, America, Jamaica, Germany, Canada, Kuwait and Afghanistan. I now manage a 60 acre Industrial Estate on the banks of the River Severn in the Forest of Dean, which I recommend a visit to as it is a beautiful part of the country. Nearly as nice as the Black Mountains, for walking. My memories of BGS are meeting Mr Stinson in his Doctor Martin boots as a first year! Being taught maths by 'Percy' Page! I can do it now Sir! But the abiding memory is of 'Jock' Longden and 'Archie ' Moore my chalk and cheese so to speak - the latter was right! When we merged playing hockey became harder especially against the likes of Alison Altoft ! But I shall always remember the great friendship and camaraderie that was in the school. It has to be said almost the best years of my life! Hopefully I will attend some events in 2011. I've just been reading the entry by Rob Beswick and it brought back some happy memories. I attended Brigg Grammar School between the years 1963 to 1970. I, too, remember Jock Longdon, Archie Moore, Mr Stinson together with 'Woody' Watts, the woodwork Master, 'Toddy' Henthorne, who taught us history, 'Chumley' Jackson (History), Mr Barker (German), Mr Atkins (French), Charlie Mailing (Music), Mr Brittain (Physics)…. the list goes on. Happy days, indeed. Not to forget, Mr Morris, whose garden we used to go through on our way to Scawby pond to do a spot of fishing. We had to sign a book in a shed at the bottom of his garden. Plenty more memories where they came from. 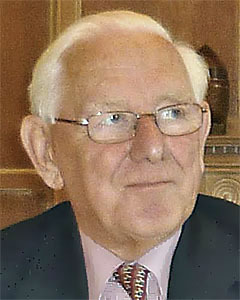 Barbara Kernon has received the sad news that Alan passed away on 8th December 2010. He came to Brigg in 1962 to head the Geography Department at the High School when Miss Bowden was Headmistress. A popular teacher he played an active part in out of school activities enjoying involvement in the school productions (in particular Comus) and running the Chess Club. He left Brigg in 1966 to take up a Deputy Headship in Downton (Wiltshire) then moved to a Headship at Longdendale in Cheshire. He and Pauline finally retired to a lovely secluded spot in Devon. Sadly he had to miss our 2007 Reunion due to the appalling weather but sent an email greeting to all his Geographers complete with this photo taken in 1993. "I was in the same year as both of these ex pupils at BGS and both sadly passed away this year. John had spent most of his post University years in the Brigg area running his own business until the last few years. Jeremy trained to be a teacher at Bede College, Durham University with me and spent his life in teaching, lecturing and work for the Ordnance Survey. He lived with his family in Plymouth in recent years. His father had been Headteacher of Glebe Road School, where his mother also taught."